The beacon sends a signal of its location, range, and display name to who ever is within its broadcasting range. However limited its function, it can serve to be an inexpensive way to keep track of property, locations, and/or items. It's purpose is simple, send out a broadcast signal from its origin to a specific range set by the player. This can be to keep track of various ships, to avoid getting lost when traveling far from your station, or to avoid crashing into the ground when approaching your planet-bound station at night. It is also capable of interacting with the relaying ability of the Antenna in which it can have its broadcast range increased. Currently, all factions (enemy or neutral) can see these signals. Also, unlike the Antenna, power usage for the beacon is very low (even for maximum range setting). Unlike antennas, small ship beacons have the same range as large ship beacons, with the same power drain. The chart below shows the maximum ranges, as well as the power usage associated with it. On many servers a Beacon is a required component for a ship to mark it as "alive". If not present, certain server-side clean-up scripts might remove your ship. You should verify whether or not a Beacon is required on a server before you log out, otherwise you might lose your ship. The power cost for the Beacon is exponential, so reducing the range greatly reduces the power cost. 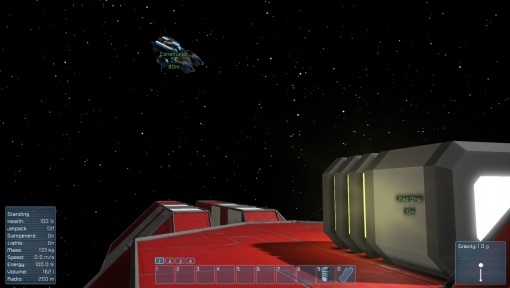 Also keep in mind that everyone can see the Beacon, including enemy PvP players on multi-player servers. For those reasons it is recommended to keep the range below 1km, unless you really need it. 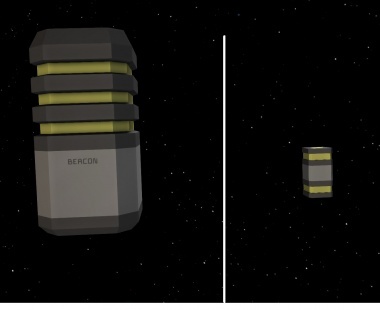 AI controlled ships do not react to Beacons at all, so it is safe to mark your ships and bases with long-range Beacons/Antennas in single-player. Right-clicking the range slider resets it back to 10000 meters. This page was last modified on 2 November 2016, at 09:45.